When a family breaks up, what about the grandparents? No grandparent relishes the news that a son or a daughter is being divorced- or, worse, that the the son or daughter has passed away. Once the shock of the situation wears off, though, there is frequently the equally gut-wrenching question of whether the grandparents will ever see their grandchildren again. The issue of grandparents' rights arises in only special circumstances and in one of three situations. Each has its own difficulties. A precondition for an issue of grandparents rights to arise is that the situation cannot be worked-out informally within the family. That is, in the case of a divorce, if the paternal grandparents have a good relationship with their son (the father of the grandchild) then the visits to grandma and grandpa are likely to continue without any intervention from the court pretty much as they have always gone. The only difference is that the informal visits must occur during periods when the father has court-ordered placement of the child. It is only if the father opposes visits with the grandparents that the legal problem arises. The most frequently occurring circumstance is divorce (or, less frequently, paternity). The second situation is in the event of the death of a parent (the child of the grandparents seeking visitation). The third circumstance, and probably the most difficult to work with, is where children have been removed from the home of their parents due to abuse or neglect (called a "CHIPS" case: child in need of protection or services). As will be set forth in more detail below, Wisconsin law provides certain "visitation" rights for grandparents. At the outset, it is important to define the term "visitation." Visitation means only that the person with such rights may have personal contact with the child or the children for a certain period of time and, usually, under some set schedule. By no means does visitation mean that the has any rights or responsibilities concerning the child's up-bringing. In the family law "custody" refers to the right to make important decisions for the child (such as religious training, school, medical care, and so forth). Therefore, the concept of visitation does not give a grandparent a legal voice in the care nor in the decision-making for the child. Undoubtedly, the most frequently occurring situation for grandparents rights is in the event of a divorce. Naturally, grandparents rights become an issue only when the parents themselves are fighting over custody and placement of the children. Although the law is most clear in the case of a divorce it can still be very tricky to deal with. This is because there is likely to be a high level of animosity between the parents in the midst of a placement battle- regrettably, the animosity that a one spouse feels for the other spouse usually carries over onto the grandparents. Moreover, grandparents rights are sometimes used by an unscrupulous litigant in an attempt to get extra placement time. Sec. 767.43(1), Wis. Stats., provides that, "[U]pon petition by a grandparent, great-grandparent, stepparent or person who has maintained a relationship similar to a parent-child relationship with the child, the court may grant reasonable visitation rights to that person if the parents have notice of the hearing and if the court determines that visitation is in the best interest of the child." There are two important phrases to note in this statute. Firstly, the statute applies not only to biological grandparents but also to a stepparent or a person who has maintained a relationship similar to a parent-child relationship with the child. The statute makes no effort to narrowly define what is a "relationship similar to a parent-child" relationship. The definition certainly includes a person who for some substantial period lived with the child and/or cared for the child. It almost certainly does not include neighbors and family friends who are fond of the child. Secondly, the statute provides for reasonable visitation. If you are a grandparent seeking visitation in the midst of a divorce case do not expect to have every other weekend and a month in the summer. When it comes to grandparents visitation the courts attempt to approximate the amount of time that the grandparents saw the child during the marriage. That is, visitation may be nothing more that three hours on a Saturday afternoon once a month. The over-arching concern is always the best interests of the child. As a practical matter, grandparent visitation is not likely to be in addition to the placement awarded to the parent on that side of the family. Rather, the court's order will usually designate a portion of the placement awarded to one parent to be used by the grandparents on that side of the family. Therefore, it is easy to understand why it is best for this issue to be handled informally within each side of the family. A second circumstance where grandparents rights become an issue is where a parent dies (that is, the child of the grandparents in question)- and then only if the surviving parent opposes visits with the grandparents. The law provides that, "If one or both parents of a minor are deceased and the minor is in the custody of the surviving parent or any other person, a grandparent or stepparent of the minor may petition for visitation privileges with respect to the minor, whether or not the person with custody is married. The grandparent or stepparent may file the petition in a guardianship or temporary guardianship proceeding under this chapter that affects the minor or may file the petition to commence an independent action under this chapter. Except as provided in sub. (3m), the court may grant reasonable visitation privileges to the grandparent or stepparent if the surviving parent or other person who has custody of the minor has notice of the hearing and if the court determines that visitation is in the best interest of the minor." Sec. 54.56(2), Wis. Stats. The same restrictions apply in this situation. The periods of visitation will be very limited. The court will not award grandparents "shared placement" so as to permit the grandparents to fill the shoes, so to speak, of the deceased parent of the child. Under Chapter 48, Wis. Stats. if the court finds that a child is in need of protection or services due to abuse or neglect the court may remove the child from the home of the parents and place him or her in a foster home. 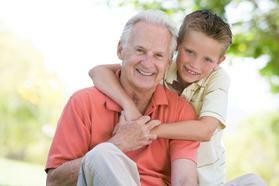 The law provides no specific right for grandparents visitation under these circumstance. By the same token, the law does not forbid it either. If this happens in your family the best course is for the grandparents to appear in court on the CHIPS case from the very start. Chapter 48 requires the court to consider a "relative placement" before it places the child in a foster home. Many times the grandparents are able to convince the court to temporarily place the child in their home while the parents work on the court-ordered conditions for the return of the child. Once the child is placed in a foster home, though, the likelihood of the court granting visits with the grandparents is very remote. Foster care visits are usually very limited for the parents. They are even more limited for grandparents. If you are a grandparent seeking to protect your rights, do not hesitate to contact an experienced family law attorney.